Martin at Dumluks pointed this cutie out to me. 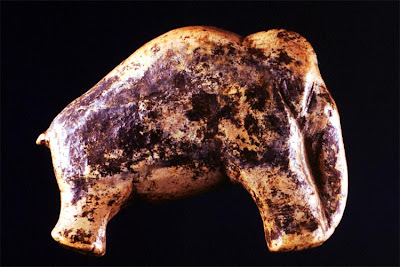 In total, five mammoth-ivory figurines from the Ice Age were newly discovered at the site of the Vogelherd Cave in southwestern Germany, a site known to contain primitive artefacts since it was excavated in 1931 by the Tübingen archaeologist Gustav Reik. The figure of the woolly mammoth is tiny, measuring just 3.7 cm long and weighing a mere 7.5 grams, and displays skilfully detailed carvings. It is unique in its slim form, pointed tail, powerful legs and dynamically arched trunk. It is decorated with six short incisions, and the soles of the pachyderm's feet show a crosshatch pattern. Some of the oldest movable art found in Europe and Northern Asia is in the form carvings of mammoth ivory. The fist artists lived ivory for the same reasons modern carvers do; it's easy to work, attractive, and has a wonderful finish that is both shiny and warm.